Situated in the commune Japca from the raion of Floreşti, the monastery was built on the place of an old hermitage founded in the 15th century by monks arrived from the Deleni hermitage. It bears the consecration of the Assumption of the Mother of God. Protected by the Patriarchy of Moscow, the nun monastery of Japca was not closed (as usually happened to monasteries in the former Moldavian Soviet Socialist Republic in the '60s), being the only monastery left alone during the period of Soviet Moldavia. The monastery was founded in 1825 by boyar Constantin Andronic, enlarged and rebuilt in 1912 in an eclectic style (it was a traditional Moldavian before!). The great church has three altars: the Assumption, the Ascension, the Holy Transfiguration and Exaltation of the Cross. The Archangel Michael winter church dates from 1849. On the coin the summer church the Assumption of the Mother of God is represented (nearly square, with a vaulted steeple in the middle), a belfry, other constructions. It is placed in the village of Curchi, commune of Vatici, raion of Orhei, being dedicated to the Nativity of Virgin Mary. Accordingly to the legend, the monastery of Curchi was founded in 1765 by Iordachie Curcă (or Iordanie Curchi), as a monastery for monks. Another legend says that the monastery was founded by Stephen the Great, then deserted for some time, and refounded later. The winter church Saint Demetrius is constructed in neo-Byzantine style. It was repaired and reopened in 2005. The summer church of the Nativity of Virgin Mary was founded in 1810 by captain Teodor Sabău and constructed in classical style, with some influences of Russian Baroque. Closed in 1958 and transformed in a psychiatric hospital by the Soviets, it was reestablish as a monastery in 1994. 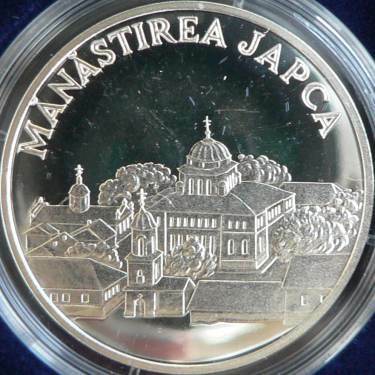 On the coin the stone wall of the monastery, the gate with the belfry and the church of the Nativity of Virgin Mary are represented. The monastery of Tabăra is dedicated to the Dormition of the Virgin and is placed in the village of Tabăra from the raion of Orhei. The monastery was founded by boyar Gheorghe Russo in 1784, or by Darie Carp, overseer of the Russo estate, in 1779. 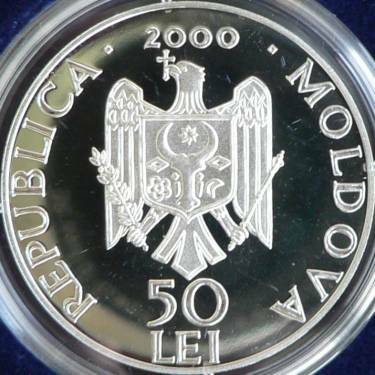 Initially, Tabăra was a monastery for monks. 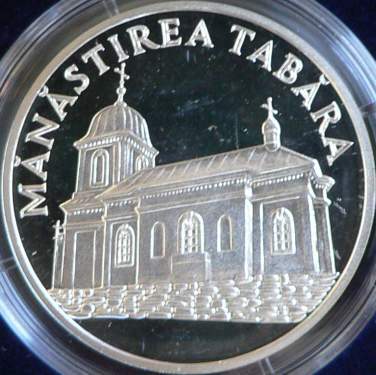 In 1815 Tabăra was transformed in a monastery for nuns. It was closed in 1960, being reopened in 1989-1990. 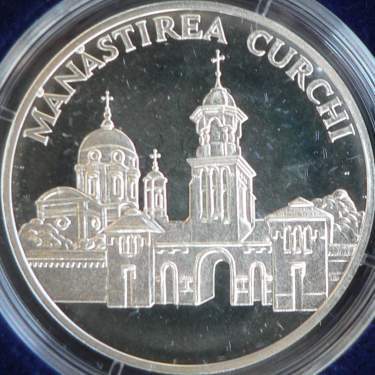 The church of the Dormition - represented on the coin - was erected in 1828. The church of the Holy Trinity was built in 1857.